I’m convinced that once I turned 60 what [very] few math skills I once possessed have disappeared into the twilight zone…along with my attention span. I’ve spent the last three weeks making this pair of earrings. During that time, I cut one up completely because I miscounted the starting row of beads and didn’t realize it until I was ready to start the bottom loop. Then, I had to cut two of the arcs off because I added an extra row of beads on one and two extra rows on another. In spite of my elderly shortcomings, I finally got them right and finished! They were fun to make and easy on my fingers. 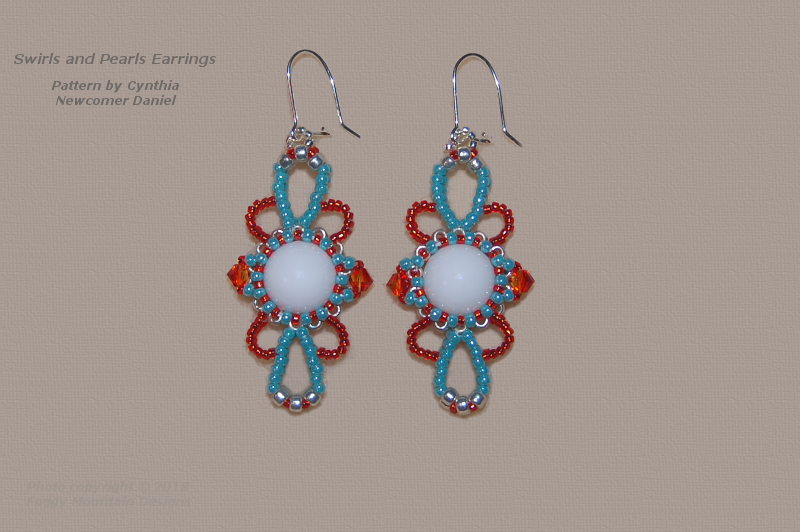 Swirls and Pearls Earrings are a pattern by Cynthia Newcomer Daniel. You can find it in her book, “Modern Beaded Lace”. I modified it a tiny bit by using 15’s for the arcs because I didn’t have the color I wanted in 11’s.